Services | Midgett Concrete Construction, Inc.
We are your one stop shop for all of your concrete construction needs! Excavate new foundations, room additions, trenches, small ponds and retention ponds, grading lots and haul fill. New foundation footings, block footings, trench footings, post footings. Straight to radius foundation walls. 1′ to 12′ in height. Retaining walls also decorative retaining walls. Perimeter draintile, 2″ exterior insulation, exterior damproofing or waterproofing membrane. Basement and garage floors, garage floating slabs, patios, walks, driveways, stoops, curbs and sealant. 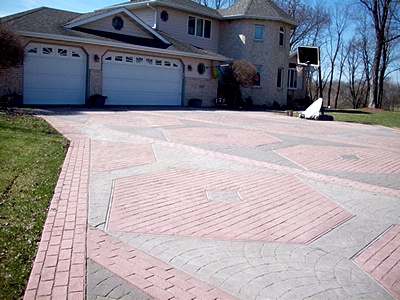 Stamped concrete, spray crete, and stenciling – – various colors and patterns available. Tearout your old concrete: Drives, walks, stoops, patios and even your old foundation. Low pressure crack injection with epoxy on poured foundation walls, walks, drives and floors, without the need for costly disruptive excavation. We’re The One Stop Shop For All Your Concrete Construction Needs!